Harpers caught up with pioneering winemaker Santiago Mayorga at Cadus – the premium arm of Nieto Senetiner, one of Argentina’s largest producers – who revealed his experimentation with Malbec clones for the first time. Rarely are the scientific components of the winemaking process laid out for all to see – or in glass to taste. There is the must or juice in the winery, but putting the process of scientific exploration and tasting different steps along the way is unusual, espcially outside of the winery itself. But that’s exactly what happened at a special tasting at London’s Gaucho this week, where Santiago Mayorga, experimental winemaker at Cadus – the premium branch of Nieto Senetiner – revealed what is cooking inside what he describes ‘kitchen’ at the moment. If Mayorga is the chef, then the particular dish we were treated to was a tasting of Malbec clones – all of which have been planted in the same Mendoza vineyard while observing as many possible empirical controls as possible. 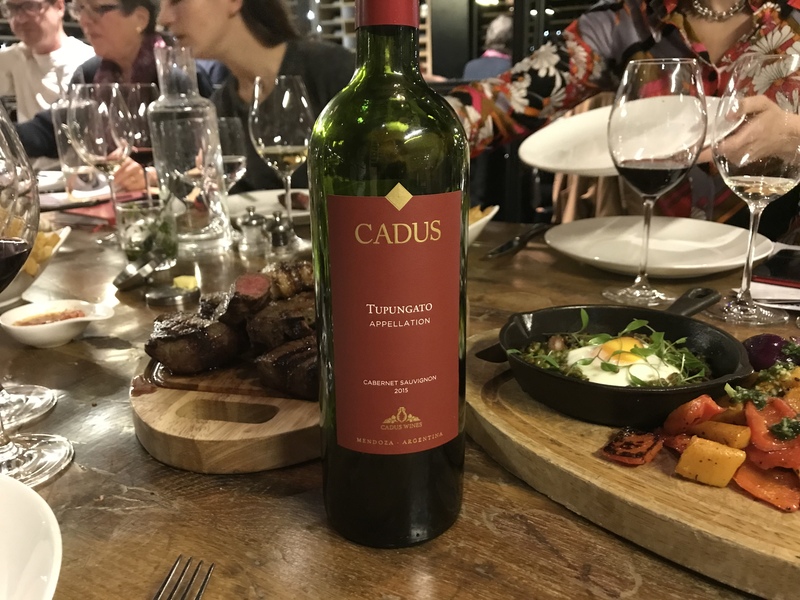 The purpose for this, apart from gaining a better understanding of the grape and which strains are best suited in Cadus’ vineyards, is to try and solve some of the problems Malbec has with flowering and yields. The exploration is also part of an objective which began with the hiring of Mayorga in 2013 - and has since been spearheaded by him - to elevate Cadus from a producer of quality wines to a producer of “next level” wines, with innovation and experimentation at their heart. The clones themselves came from Argentinian agency the National Agricultural Technology Institute (INTA), and around ten have been planted at a single site in the Tupungato appellation in the north of Mendoza’s Uco Valley. There is no guarantee that any of these will make it into bottle, although Mayorga is toying with the idea of making a barrel of two of the clones as single varietals to take things to the next stage. Still, he says, it’s a great way to show the world the innovation that is taking place in the winery kitchen and is also a great way to investigate. The best of the bunch – no pun intended – showed real promise in solving some of the issues with fruit and had a wonderful violet flavour. The next best was more astringent but still had a punchy, up front fruitiness. Fascinating for the wine geeks around the table, but bringing these wines to market in a way that engages or even makes to consumers throws up problems. “It is very difficult to market this as it’s too scientific,” Roberto Meli, export manager at Cadus, said. However, experimentation is integral to the winery’s future and to cement its reputation as a producer that is committed to innovation. At the moment, the Appellation wines launched as Mayorga’s own project when he joined in 2013, have successfully found a niche with Boutinot in the UK between approximately £15 and £20. However, Meli believes that Cadus and Argentina in general is now ready to attempt a higher price bracket by way of further investigation in the vineyard and winery (or lab, or kitchen). According to Meli, Argentina’s rapid wine evolution began in the late eighties with influences from Europe having knock-on effects. The change catalysed the shift from Argentina as inward facing, to an outfacing wine producing country. Next came the drive in quality in order to compete in competitive foreign markets, which in turn led to the establishment of regions such as the Uco Valley as prime winemaking spots. Investment in quality techniques and also a favourable exchange rate attracting international buyers meant that by 2003, Argentina had become a large export market. It has been a “learning process” says Meli. Now, innovation is critical to order to keep ahead of the competition at the high end as is communicating the concept to the consumer. Mayorga and Cadus also have shifting weather patterns to contend with. Argentina is just now coming out of the stormy El Niño period which placed much stress on vineyards in 2015 and 2016, and are now about to enter a string of hotter years with La Niña. Mayorga is planning ahead to preserve the balance as the climate shifts. To maintain that style in warmer years, he plans to harvest earlier in order to preserve the elegance and to irrigate so as not to lose yields. In terms of oak: bigger volumes and less new oak, including some second and third use. “Between 2005 and 2013, Malbecs were really concentrated, with upfront fruit, flavours of rich prunes and velvety tannins,” adds Meli. As the desert-like conditions of La Niña prepare to return, picking early will play a key role in keeping things fresh and away from the “big fruity wines” of old. In Uco Valley, winemakers also have the added benefit of a continental climate, with the altitude and position of the Andes helping to bring in cool evening climates which will help to maintain concentration. Cadus has demonstrated its kudos as an example of what new Argentina needs to do to keep up momentum. It isn’t resting on its laurels, is outward facing, while also ambitious and hungry to see what it can achieve in the vineyard – and also the kitchen of course.